The picture above and the one at the bottom of the page were taken last Tuesday the last day anyone was able to combine. 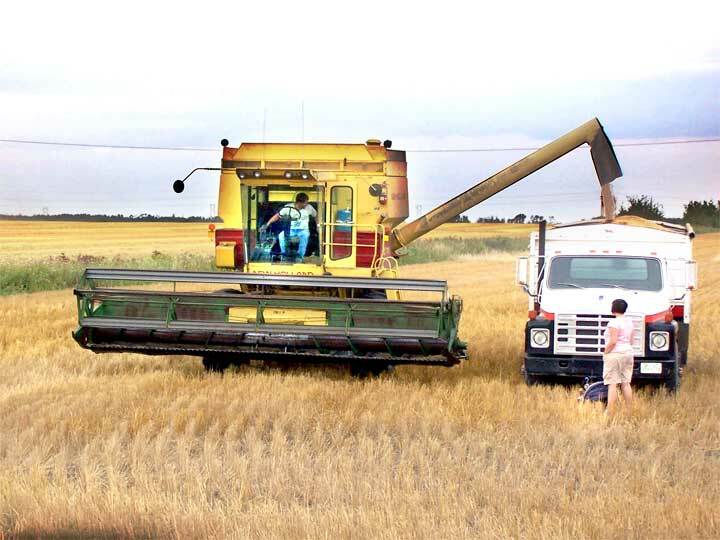 At that point farmers were straight combining wheat. It looks like most of the oat crops are ready but barley was planted late this year and will be the last crop to be harvested. 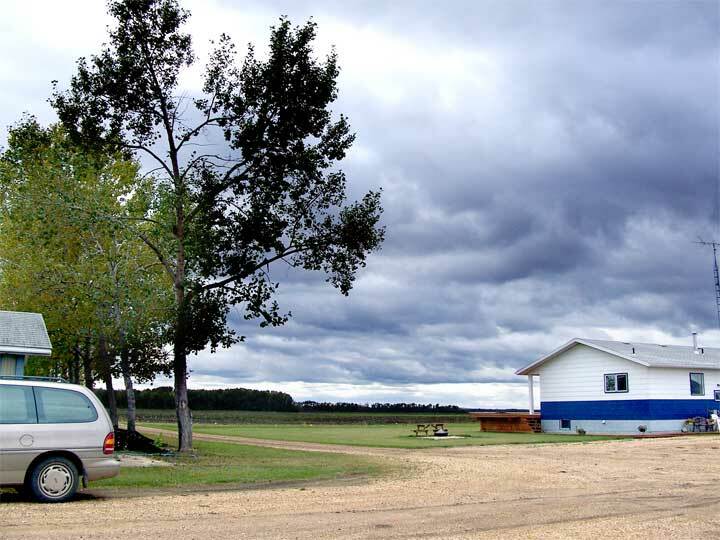 Since Tuesday the sky has looked pretty much like it did Saturday (right) when we drove out to Weekes through the area around Porcupine where there is little if any crop to be harvested. But the crop in the Weekes area did suffer from spring flooding and for most farmers that part of the year's story is already finished with crop insurance claims of about 20% on most fields. Peas were hardest hit as they were planted early and much of those were washed away. What is left out there in the fields is a remarkable crop of wheat waiting to be straight combined. Its quality is still outstanding as a number 1 variety but these close to freezing temperatures and prolonged period of wet weather could make a drastic change in that crops value. Most wheat crops are still standing. Canola on the other hand is either lying in swath or in the process of being cut. It is hard to tell just what the yields on the massive acreage of Canola planted will be. 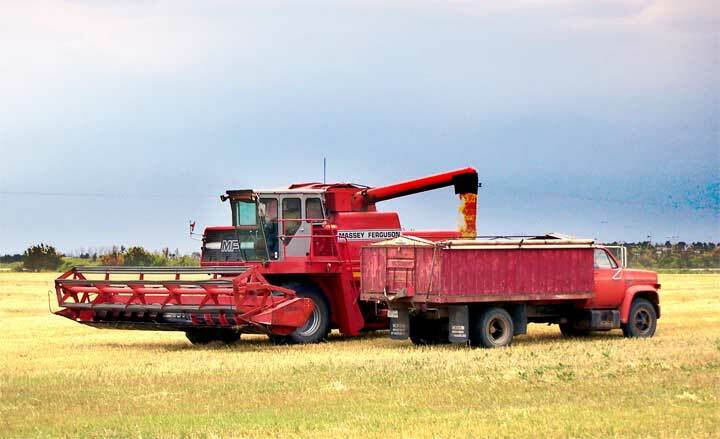 Most farmers figure that the pods have filled but that long period of high temperature in July was not especially good for a developing Canola harvest. Right now there are huge swathes out their with about 60% of this year's harvest in this part of Saskatchewan sewen to Canola. At this point the dampness and the low temperatures have not affected the quality of the crop but that could change with even more adverse weather. Barley, in the Weekes area was sewen last this year because of the wet conditions and will be the last of this year's harvest to come off the fields. The quality of that crop is looking very good and farmers have high hopes for this year's barley harvest although the amount in comparison to other crops is lower than other years.